The concept of self-organized criticality (SOC) describes a variety of phenomena ranging from plate tectonics, the dynamics of granular media and stick-slip motion to neural avalanches . In all these cases the dynamics is marginally stable and event sizes obey a characteristic power-law distribution. It was previously shown that an extended critical interval can be obtained in a neural network by incorporation of depressive synapses . In the present study we scrutinize a more realistic dynamics for the synaptic interactions that can be considered as the state-of-the-art in computational modeling of synaptic interaction (Figure 1) . 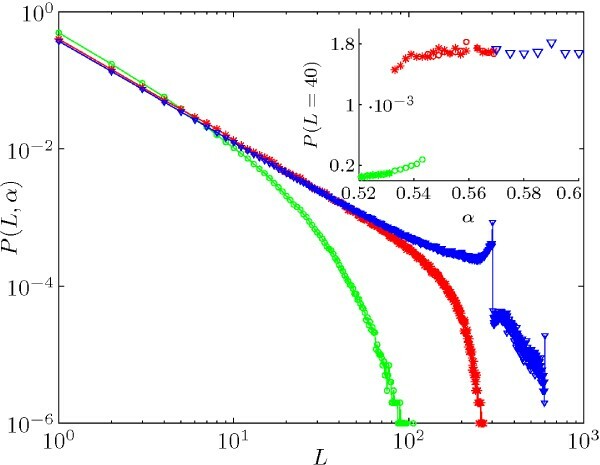 Interestingly, the more complex model does not exclude an analytical treatment and it shows a type of stationary state consisting of self-organized critical phase and a subcritical phase that has not been previously described. The phases are connected by first- or second-order phase transitions in a cusp bifurcation. Switching between phases can be induced by synchronized activity or by activity deprivation (Figure 2). We present exact analytical results supported by extensive numerical simulations. 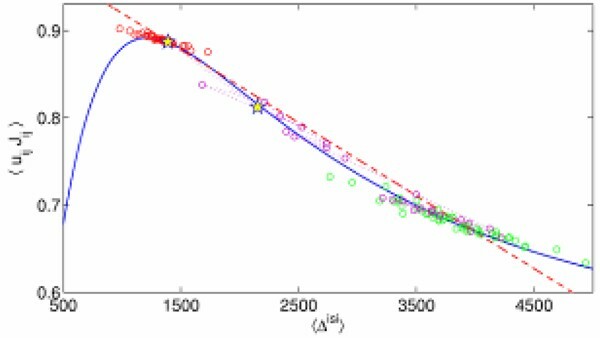 The distribution of avalanche sizes changes in dependence on the interaction parameter α from subcritical (circles, α = 0.52) via critical (stars, α = 0.56) to supercritical (triangles, α = 0.59). The inset shows the hysteresis of the distribution at an exemplary avalanche size (L = 40). The circles result at increasing α, stars at decreasing α. Dynamic transition from a critical (red circles) to a subcritical state (green circles) by short-term activity deprivation. The two stars represent the immediate effect of the deprivation in a particular trial. By elucidating the relation between the elementary synaptic processes and the network dynamics, our mean-field approach revealed a macroscopic bifurcation pattern, which can be verified experimentally through predicted hysteresis. Furthermore it may be able to explain observations of up and down states in the prefrontal cortex  as well as the discrete changes in synaptic potentiation and depression  as network effects.